It’s been a couple years now since these were taken, but they were made on a long weekend in the San Juan Mountains in Southern Colorado. We stayed in a cabin north of South Fork eating the best batch of homemade burritos we’ve managed, and spent the days on unimproved roads. We drove down U.S. Route 285 from Denver and into the San Luis Valley, stopping to explore the Saguache County Museum on the way to South Fork. The museum is among the largest and best-stocked of all the rural museums I’ve seen in Colorado, and houses a vast array of items and artifacts, some dating to the early 18th century. Many of the things on display belonged to ancestors of the museum’s current staff, which means there are a lot of stories for the telling if you have time to listen. After the unanticipated stop — I have a terrible habit of trying to pack way too much into any given day on the road — we didn’t arrive at our cabin at the Blue Creek Lodge south of Wagon Wheel Gap until well after dark, but found it comfy and well-appointed. Our first day there, we wandered around the northern San Juan Mountains in a roundabout search for the ghost town of Summitville. After gold was discovered in the area, Summitville sprang up and the population grew to 600 or more, with at least 250 mining claims being worked in the area by 1885 before veins began to dry up and miners followed the strikes elsewhere. Aside from minor revivals in the late 1880s and 1890s that only lasted a year or two, the town remained largely deserted until the 1930s, when copper production proved viable. The mine lasted for 15 years during that rally, producing much-needed supplies during World War II and until about 1950. By 1956, the population had dwindled to a mere dozen miners, and abortive attempts to restart the mine continued until a major discovery in the 1970s led to open pit mining for gold, silver and copper. The Summitville Mine’s last gasp lasted until 1991, when contamination in the Alamosa River was linked to the mine’s heap leaching — a process that uses sodium cyanide solution to recover gold from low-grade ores. The mine’s owners declared bankruptcy in 1992 and the mine has been a Superfund site ever since. There are about two dozen well-preserved structures still standing at the townsite, though most date from the 1930s revival of the town rather than the original settlement in the 19th century, much of which was reportedly destroyed by fire in 1883. Along the valley floor are the partially-collapsed remains of the pump house, which features a chimney door for winter access. The town is just below treeline at around 11,400 feet of elevation, where snow can drift as deep as 20 feet at times. 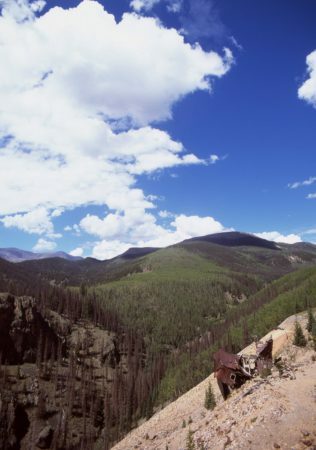 Some of the still-standing buildings are inside the fence for the reclamation project and restricted, but two large groups of cabins and offices remain accessible straddling the road through the valley. Additionally, the entire north side of the gently sloping valley is littered with debris from collapsed and deconstructed buildings. 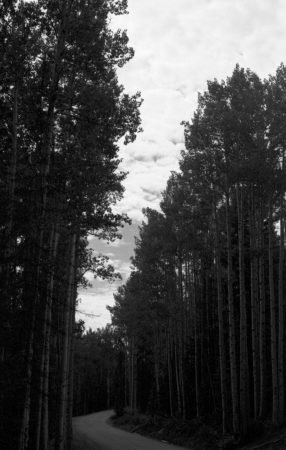 Along the way, we spend a couple hours wandering around on Forest Service roads, amidst tall pines and aspen stands, and looking across valleys whose floors are still 10,000 feet above sea level. Even on the better-tended roads, the sense of solitude and silence was phenomenal. In the evening we built a fire in a giant fire kettle in front of the little cabin, toasted marshmallows and ate more burritos. The green chile we made for that batch of burritos turned out to be the best we’ve ever made, and I’ve tried unsuccessfully to replicate it more than a dozen times since. I also hope to one day own a fire pit like the one at the cabin — it was a giant kettle made of about quarter-inch-thick steel, with a torch-cut trees-and-mountains-and-elk pattern around the rim. It was at least four feet in diameter, so I’d guess its capacity was 600-700 liters. I’m not particular about the pattern so much as the size and solidity. The next day, with a long drive ahead of us, we started extra early and took a short morning detour to rumble around north of Creede. 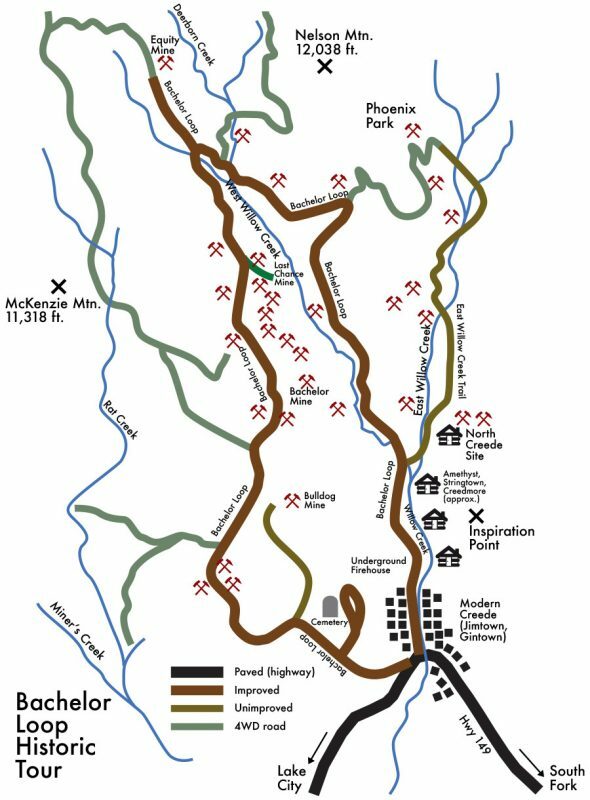 We took the East Willow Creek Road through the original Creede townsite and up through Phoenix Park before rejoining the main route of the Bachelor Loop. 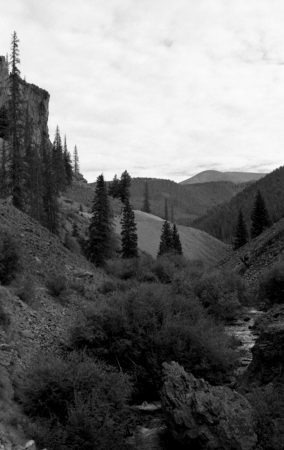 Spreading up the East Willow Creek Valley from the confluence of East and West Willow Creeks, Creede expanded rapidly after a major silver strike in 1890. The population exceeded 10,000 after growing at a rate of 200-300 new residents per day in 1891, with the community spread across the camps of Gintown, Creede, Amethyst, Stringtown, and Creedmore. 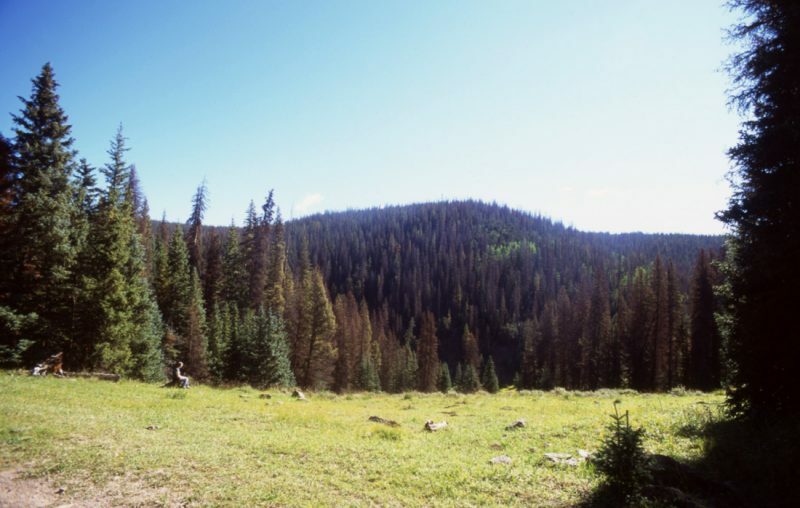 By 1892, lots were being sold south of Jimtown (formerly Gintown, at the entrance to the canyon) in an area called South Creede. Creede’s gambling halls and brothels were renowned and the action reportedly went on all night in the boom years, as immortalized in this poem by Cy Warman, the editor of the Creede Candle newspaper. Dug from the dreary earth. And there is no night in Creede. Are lined with glittering gold. 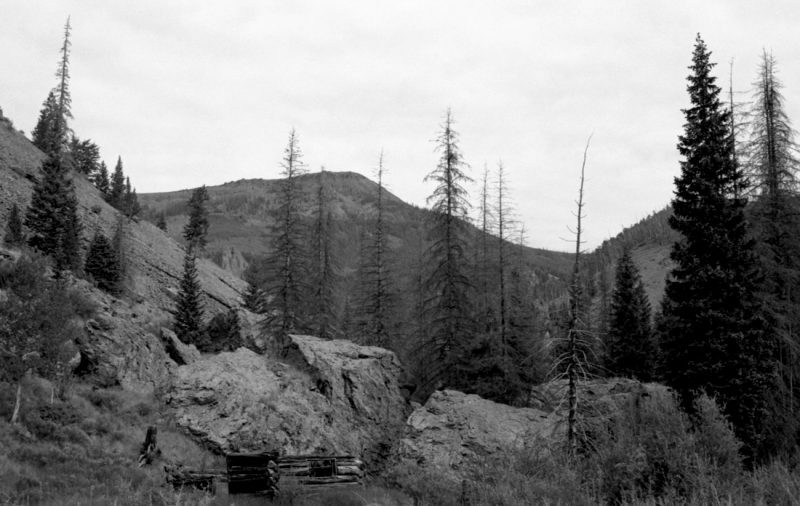 Fires and floods in 1892 and 1893 devastated the thrown-together wooden structures, and rebuilding was focused in the Jimtown-South Creede area, which took on the Creede moniker as disaster after disaster continued to destroy any settlements along the narrow valley floors. 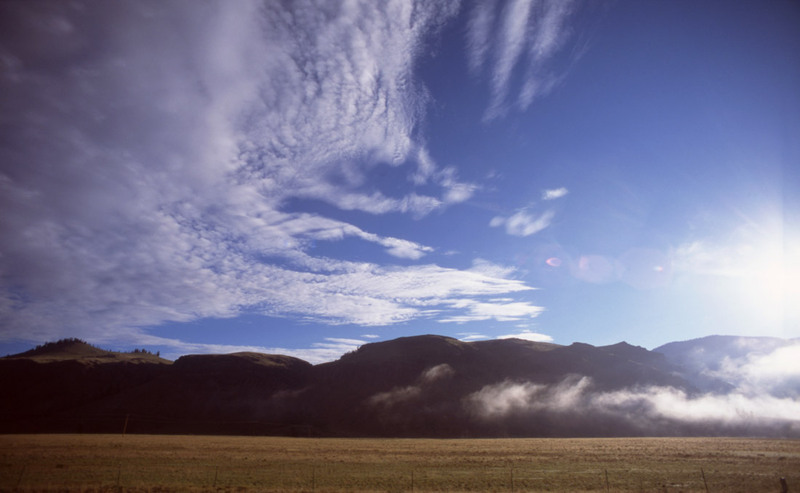 By the Panic of 1893, what was once Jimtown’s Main Street had become the center of town, and the last remnants of settlement above the Willow Creek Junction were mouldering as North Creede. When silver prices bottomed in 1895, the mines were forced to close and the population dwindled rapidly. 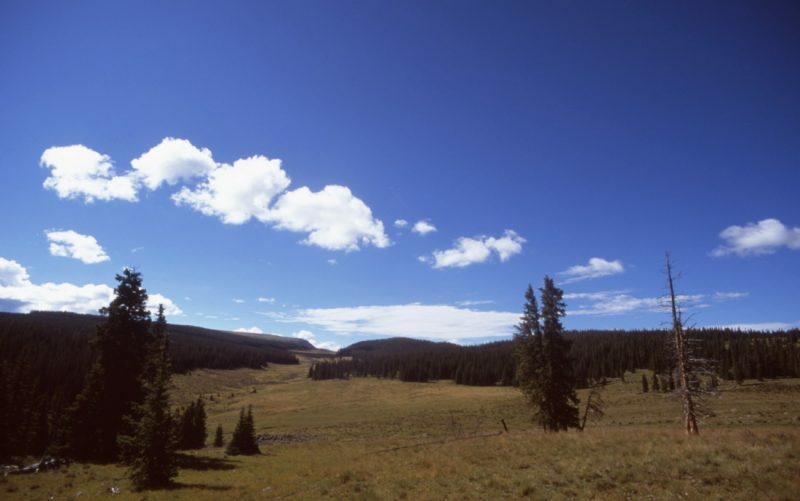 Today, there are only about 800 year-round residents in Creede. Creede boasted dozens of now-famous residents in those few short years of prosperity, including gunslinger Bat Masterson, gambler Poker Alice and Old West gangster Jefferson Randolph “Soapy” Smith. Creede was reportedly where a six-year-old Jack Dempsey vowed to help his overworked mother when he grew up, before he made good as one of the greatest professional boxers of all time. Bat Masterson, whose history as a gunfighter and lawman saw him spend time in virtually every noteworthy lawless town in the American West, counted among his friends Wyatt Earp, Luke Short, John Henry “Doc” Holliday, Charlie Bassett, and William “Buffalo Bill” Cody. He was at the Battle of Adobe Walls and was involved in both the Royal Gorge Railroad War and the Dodge City War, as well as being a regular at Dodge City’s famed Long Branch Saloon. Tempers were notably short in mining boom towns, with guns drawn frequently. One evening, when a drunk slapped Masterson, who managed the Denver Exchange Club at the time, the crowd went silent in anticipation of Bat’s reaction. To the disappointment of the patrons, Masterson just chuckled and told the offender to try again when he sobered up. Soapy Smith earned a reputation as a conman and minor crime boss in Denver in the 1880s, and when Creede exploded in the midst of Colorado’s last great silver boom, Smith saw opportunity. He got his nickname after years of running a con in which he would present marks with a pile of soap bars, tucking a few $10 and $20 bills, and a single a $100 bill, inside the wrappers of a few bars, then offering to sell the bars for $5 apiece. A collaborator would step up to buy the first bar, invariably nabbing the $100 bill and setting off a frenzy of buying. Though Smith was the nominal boss of the Creede area during the boom years, he was thought of by most as an “honest” con man, always careful to warn players at his table of the big risk they were taking. Earning as much $200 a night (over $5,000 in 2016 dollars), Smith never saved a penny. He built the New Orleans Club on Creede Avenue with Joe Simmons, and spent much of his questionably gotten gains funding the construction of area churches, grubstaking prospectors, helping mine widows and others down-on-their-luck, and paying burial costs for the penniless unfortunates of the town’s notorious red light district. Robert Ford, the admitted killer of Jesse James — who’d been pardoned just two hours after being sentenced to hang for the crime — reportedly made it to Creede before Smith and set up shop. Smith’s racket and gang were cutting into Ford’s business, and Smith’s well-known intention to run Creede might have led to war if not for a meeting arranged to avoid bloodshed. Seeing he was outmatched by the cleverer Smith and his gang, Ford opted for a slice of the pie while letting Soapy hold the plate. Soapy’s strong grasp and the fair-dealing sheriff he installed are credited with keeping Creede from becoming as lawless as other boom towns had just a few years earlier across the Southwest. When Creede dried up, Smith took his soap bars and his gang to the gold fields of Alaska, running Klondike towns as he’d bossed Creede. Soapy was shot dead at 38 in a gunfight in Skagway on July 8, 1898. He was worth just $250. The fires of 1892 had destroyed Ford’s casino and dancehall, the Exchange, and so he was operating out of a tent while a new building was being constructed when Edward O’Kelly rode into town. O’Kelly had been recently elected town marshall of Bachelor City, high on the side of the West Willow Creek Valley north of Creede, and was known for the sawed-off double-barreled shotgun he kept in a scabbard on his saddle. Ford, long thought to be a paranoiac and coward, had been known to sit in the far corner of his own saloon, facing the door, with a loaded revolver on the table by his hand. Startled by O’Kelley, Ford fumbled for his gun but was too slow — O’Kelly loosed both barrels into Ford’s face and neck. 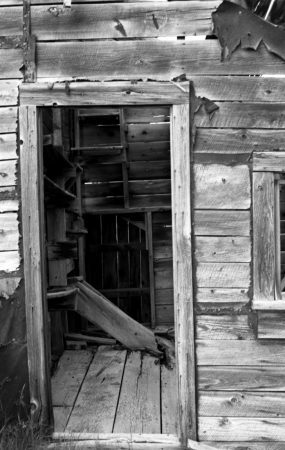 Before he made it out the door, O’Kelly was captured by a deputy who had been in the bar, and taken to a cabin outside of town in the open. Ford was at least respected by the townfolk, and a mob formed quickly demanding a lynching. Rumors swirled that O’Kelly had been a friend of Jesse James before the outlaw retired and was betrayed by the Ford brothers (Charles, addicted to morphine and dying of tuberculosis, killed himself in 1884). We made it to Creede too early for the Underground Mining Museum, but we did find tasty coffee and munchies at The Far Dog in downtown. The East Willow Creek Road route has some sections that required the Jeep’s high clearance and hill-climbing abilities, but the Bachelor Loop is passable by passenger cars using the West Willow Creek Road. The steeper sections of the East route offered stunning views, and at one point the road turns a switchback before climbing a thousand feet in about half a mile, the road cutting a swath through the aspens only a couple feet wider than the Jeep. The Last Chance Mine was discovered by a grub-staked prospector on the last trip into the district he was able to raise funds for. After successes and failures, the mine wound up spending nearly 100 years in one family. Producing first gold and then silver, the mine later became a consistent producer of amethyst geodes in addition to low grade precious metal ores. The Last Chance had been idled for decades before it was sold to the current owner, who bought it with the intention of restoring and preserving it. Several of the now-restored buildings are set up as rough cabins available for tourists to stay in for nothing but the hope of a small donation. The views from the mine, perched hundreds of feet up the steep valley wall, are impressive, and the mine offers a vast area of fossil and rock samples at impressively low prices. Rock hounds are welcome to paw through the waste rock at the Last Chance, which has produced literal tons of geodes and fossils, and take home anything they find for a modest fee. 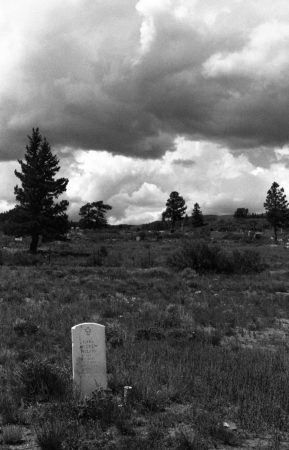 Back in Creede, don’t miss the Sunnyside Cemetery, home of the relocated Immaculate Conception Mission church. Bob Ford was buried in Sunnyside Cemetery, though his remains were later exhumed and reburied in Richmond, Virginia. We drove back to Denver by way of Lake City and managed to get into the Metro Area in time to have dinner at Yuan Palace Mongolian Barbecue on Arapahoe Road. For being a three-day trip, it managed to be relaxing and memorable. All these pictures were made with 35mm film. 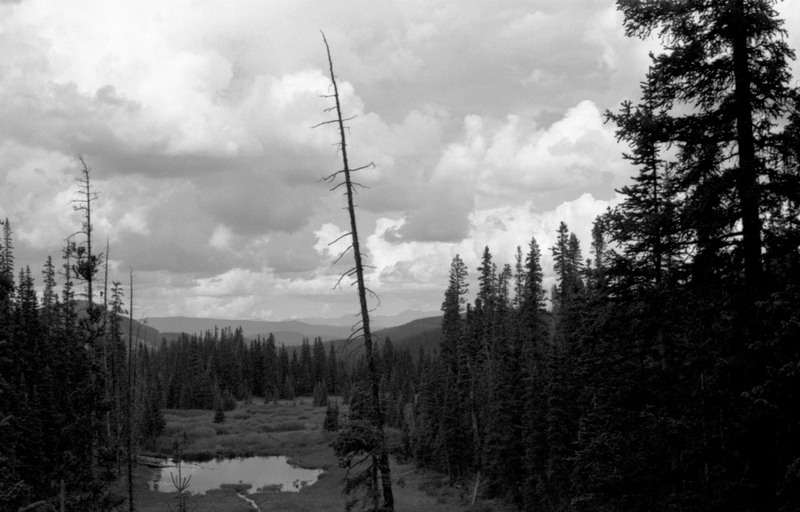 The black and white photos are Kodak Plus-X 125, shot with my Nikon F3 and (mostly) the Nikkor 50mm f/2.0 AI-s lens. The color photos are Kodak Ektar 100, shot with my Nikon FM2n and (mostly) the Nikkor 24mm f/2.8 AI-s lens. Information about the history of Creede compiled from several printed booklets created by the Creede-Mineral County Chamber of Commerce and Creede Historical Society, and “Colorado Ghost Towns and Mining Camps” by Sandra Dallas.